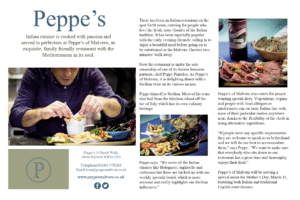 Peppe’s, independent Italian restaurant, Malvern. Serving delicious, freshly prepared dishes inspired by Italian, Mediterranean and Sicilian influences. Providing a relaxed and friendly environment. Catering for many dietary requirements including vegetarian, vegan and gluten-free options available.